it is a lengthy process as BHP lines up all the necessary government approvals before taking the project to its board next year. South Australia digs deep to take part in mining boom Telegraph UK 28 Sept 11, Deep in the South Australian outback, change is in the air. Quite literally in fact, since the plans under way to develop the Olympic Dam mine will create a site so vast that it is expected to affect local weather patterns. Tobacco Companies Knew of Radiation in Cigarettes, Covered It Up, By CARRIE GANN, ABC News Medical Unit, Sept. 29, 2011 Tobacco companies knew that cigarettes contained a radioactive substance called polonium-210, but hid that knowledge from the public for over four decades, a new study of historical documents revealed. Scientists from the University of California, Los Angeles, reviewed 27 previously unanalyzed documents and found that tobacco companies knew about the radioactive content of cigarettes as early as 1959. The companies studied the polonium throughout the 1960s, knew that it caused “cancerous growths” in the lungs of smokers, and even calculated how much radiation a regular smoker would ingest over 20 years. Then, they kept that data secret. * If we take action and disaster is averted, there will be massive avoidance of human suffering. * If we take action and the climate change problem abates for other reasons little is lost and we benefit from a cleaner environment. * If we fail to act and disaster results then massive suffering will have been aggravated by stupidity. New Radiation Limits Demanded for Children, By Suvendrini Kakuchi TOKYO, Sep 29, 2011 (IPS) – The threat of radioactive contamination faced particularly by children after the Mar. 11 nuclear disaster in Japan has touched the heart of the Japanese public, and become a major political and social issue. Malaysian MP accuses Australian company of fraud, 702 ABC Sydney , 29 Sept 11, South East Asia correspondent A Malaysian MP has accused an Australian company of corporate fraud in relation to the building of an ore processing plant in Malaysia. The Lynas Corp plant will process ore from Western Australia in Malaysia, extracting rare earth minerals for hi-tech manufacturing. The ore contains low levels of radiation, but the Australian company says its plant will be safe. But Malaysian MP Fuziah Salleh has lodged an official complaint with the Australian Securities and Investments Commission (ASIC). In a letter to ASIC, she says the company promised the International Atomic Energy Agency it would intensify consultation. She says the company’s failure to publicly release a waste disposal plan amounts to corporate fraud…..The plant is expected to be complete by the end of the year..
Nuclear waste transport opposed in South Australia 9 News, 29 Sept 11, A plan to ship nuclear waste through the South Australian Riverland puts one of Australia’s major food bowls at risk, the state opposition says. Riverland Liberal MP Tim Whetsone said the state government was totally opposed to a nuclear waste dump being located in South Australia and must take the same stand against the transport of nuclear waste. A federal government report has advised against transporting waste from the Lucas Heights nuclear reactor in Sydney throughthe Blue Mountains to a proposed nuclear dump in the Northern Territory. Instead it suggests shipping the waste by road through South Australia. Mr Whetstone said that would put the Riverland’s food production at risk of contamination along with water supplies from the Murray. “Much of this production is export focused and transporting nuclear waste through the Riverland sends a bad message to critical export markets,” he said. “Transporting waste along the Sturt Highway will involve nuclear waste being in close proximity to the River Murray for much of the journey. “The risk to SA’s water supplies is unacceptable…. 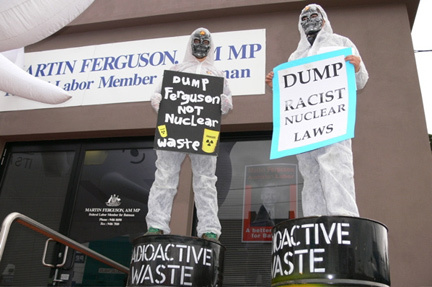 MARTIN FERGUSON MISLEADS SA ON NUCLEAR DUMP, 28 September 2011, Federal resources minister Martin Ferguson’s mishandling of the contentious plan to truck nuclear waste through SA to a dump site in the NT reached a new low with his misleading comments on ABC Riverland radio this morning. “The fuel tax credits effectively act as a massive subsidy for BHP Billiton, begging the questions as to why the Federal Government is subsidising one of the largest mining companies in the world.” said Nectaria Calan of Friends of the Earth Adelaide. 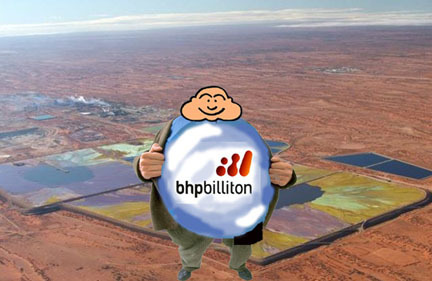 Once known as the “Big Australian,” BHP is now 76 per cent foreign owned, so whilst the Federal Government is funneling taxpayers money into the company, the vast majority of its profits will end up overseas. BHP Billiton – record profits and still on corporate welfare, 30 Sept 11 The Olympic Dam Expansion Draft Environmental Impact Statement states that the proposed new mine will require 346 million litres of diesel per year in its initial development stage, 394 million litres per year in the intermediate stage, and over 490 million litres per year at full production. This is in addition to the 26 million litres per year currently used at the mine. Paladin raising fails to impress, SMH, Peter Ker, September 30, 2011 “……Paladin has endured an annus horribilus this year, as an easing uranium price, rising costs, reduced production targets and concerns about debts have savaged the company’s share price to barely a quarter of its former value…..
Paladin closed 14¢ lower at $1.17, the company’s lowest share price since June 2005…. Paladin is not the only uranium play seeking funds. Uranex wants to raise $4.7 million through a placement to institutional investors and a share offer to existing shareholders….